1) How do I get my child to take supplements? First, explain to them that the supplements are like medicine, and are designed to help them feel better. Powder: We recommend letting the child pick their favorite strong-tasting juice (cranberry, grape, mango, etc.). Then, give them a sip of pure juice (to coat the tongue), then the powder mixed with juice, and then pure juice. Alternatively, some parents have mixed the powder with melted dark chocolate with a little coconut oil, and then let it cool in a mold in the fridge. Dairy-free chocolate is available. Swallowing Pills: Start with very small pills that are empty (they can be purchased at most drugstores), and take them with water or juice. Slowly work up to larger pills. Rewards/Bribery also helps (hugs, praise, extra tv/videogame time, etc). 2) Should I try to hide supplements in food? No, children with ASD can usually detect even small changes in their food, and don't like being tricked by their parents. So, we recommend just telling them that the supplements are good for them. 3) How do I know if my child will benefit from a vitamin/mineral supplement? For vitamin/mineral supplements, a 2-3 month trial is usually enough to determine if there is benefit. In the Adams et al 2012 study, about 1/3 of participants found no benefit, about 1/3 had some benefit, and about 1/3 had substantial benefit. Although medical testing of nutritional status can be done, it is easier, cheaper, and more reliable to just try it. Children with limited diets without enough vegetables, fruits, and meats/protein are likely to benefit the most. 4) How do I know what dosage is best? In the Adams et al 2012 study, most participants gradually increased to the full dose of the vitamin/mineral supplement over 3 months. However, a few families found that their child did better at 50-75% of the full dose, so they stayed at that dose. Each child is an individual, so it is okay to individualize their dosage. 5) Should I try Methyl-B12 injections in addition to ANRC Essentials? In the Adams et al 2012 study, it was found that the oral vitamin/mineral supplement was able to improve methylation and glutathione approximately the same as injections of methyl-B12. Part of the reason appears to be that the vitamin/mineral supplement also contains vitamin B3, which is needed to recycle glutathione (convert it from the oxidized to reduced form). 6) Is it dangerous to take too much of a vitamin/mineral supplement? Most vitamins are water soluble, so excess amounts of them will be excreted in the urine. A few vitamins (A, D, E, K) are fat-soluble, so a little caution is needed, but the dosage in ANRC is safe to take daily. For minerals, the body can also excrete excess amounts of some of them, but excess amounts of others can cause problems if too much is taken for a long time, but the dosage in ANRC is safe to take daily. 7) Is it better to take a vitamin/mineral supplement or eat fruits and vegetables? Fruits, vegetables, legumes (beans), and meat/poultry/fish contain many important vitamins and minerals. Fruits and vegetables also contain many phytonutrients that are not included in vitamin/mineral supplements. So, we recommend eating 4-6 servings/day of whole fruits and vegetables. However, for children with ASD, they usually have an increased need for certain vitamins/minerals, so we recommend they also take a multi-vitamin/mineral supplement, especially if they have a poor diet. 8) How do I know if I need extra vitamin D? Your body can make enough e vitamin D if you have direct exposure to the sun for about 30 minutes/day. Windows, clothing, and sun-tan lotion block the part of the spectrum needed to make vitamin D. Most people spend too much time indoors, and do not get enough vitamin D. People with darker skin are at greater risk. You can ask your physician to measure your level of vitamin D, especially if you don't get enough sun. ANRC Essentials contains enough vitamin D for most people, but some people may need more. 9) Do I need extra iron? ANRC Essentials does not contain iron because most people do not need it. A blood test can detect if a child has low iron - only supplement with iron if there is a need, as too much iron can be a problem. However, girls/women who are menstruating should consider a daily iron supplement due to blood loss. Young children (under age 5) also commonly have low iron and should be checked.Low iron causes anemia, which is low amount of red blood cells, which are critical for carrying oxygen to different parts of the body. Low iron in infants can impair intellectual development, so it is important to check. Sleep problems are sometimes due to low iron. 1) How do I get my child to eat more vegetables? Vegetables can be juiced in a high-speed blender (best) along with some fruit for flavor, and served as a cold drink. Ground vegetables can be mixed into other foods, including tomato sauce, muffins, soups and stews. Carrot sticks, cucumber slices, and zucchini slices can be eaten plain or dipped in sauces or humus. Celery sticks can be dipped in nut butter. Try salads with different salad dressings. Let your child help prepare the vegetables, and let them play with them so they become comfortable with them. Consult a feeding therapist if you have trouble getting your child to eat healthy foods. Also consult books on picky eaters such as "Just Take a Bite" by Lori Ernsberger. 2) How do I get my child to eat more protein? Some children don't like eating some protein foods because of the texture, taste, or difficulty chewing them. So, some options are to grind them up, add them to a stew to soften them, or try other sources like nuts, nut butter, and beans/legumes. Consult a feeding therapist if you have trouble getting your child to eat healthy foods. 3) How do I know if the GFCF diet will help? There is no lab test that is definitive. The best approach is to just try the diet - 1 month for dairy-free, and 3 months for gluten-free. It seems to help about 2/3 of children and adults with ASD, and especially those who consume high amounts of gluten or milk products. Often benefit is seen within a week, but it can take longer. 4) Is it better to eat fish or take a fish oil supplement? Large fish like shark and swordfish are at the top of the food chain, meaning that they eat medium fish which eat little fish, so toxins like mercury and toxic chemicals accumulate in them. The FDA warns pregnant women not to consume a single serving of shark or swordfish during their entire pregnancy, as one serving is enough to increase the risk of neurological damage to their child. Tuna has lower levels of mercury, but because people tend to eat more of it. The FDA estimates that 1 in 6 women in the US has high enough mercury in their body that it increases the risk of neurological damage to their infant. Since most studies show that children with autism are especially vulnerable to toxic metals and toxic chemicals, we recommend totally avoiding large fish (shark, swordfish) and limiting or avoiding tuna. Salmon and small fish (anchovies, sardines) are safe to eat, and are a great source of omega-3 fatty acids and protein. So, we recommend either eating at least one serving/week of small fish, or taking a fish oil supplement. 5) How do I choose a high-quality fish oil supplement? Use your nose - if it smells bad, it is bad. A fresh, high-quality fish oil should have only a mild taste to it. 1) How do I know what supplements to try? In most cases we recommend starting with a multi-vitamin/mineral supplement such as ANRC Essentials or similar brand that includes significant amounts of folinic acid, vitamin B6, vitamin B12, zinc, magnesium, and other key nutrients. A blood test can detect if a child has low iron - only supplement with iron if there is a need, as too much iron can be a problem. However, girls/women who are menstruating should consider a daily iron supplement due to blood loss. Young children (under age 5) also commonly have low iron and should be checked. Low iron causes anemia, which is low amount of red blood cells, which are critical for carrying oxygen to different parts of the body. A blood test can detect if a person has low vitamin D - this is common if people have less than 1 hour/day of direct exposure to the sun (windows, clothing, and sunscreen lotion block most of the sunlight needed to make vitamin D).. Essential fatty acids (fish oil) are recommended if you eat seafood less than 1x/week. Digestive enzymes are especially recommended if there are loose stools or gaseousness, especially after consuming carbohydrates or milk products. This is because many children with autism have low amounts of digestive enzymes for carbohydrates, and especially low amounts of lactase, the enzyme that helps digest lactose, the sugar in milk. Melatonin is often helpful for sleep problems; iron can also be helpful. Epsom salt baths help many children with ASD; try it for several weeks and see if there are benefits. Amino acids can be helpful if a person does not each much protein or has trouble digesting it. The best absorbed form are "free-form" amino acids, as they are easily absorbed, as opposed to amino acids that are part of larger protein molecules. Carnitine has proven to be helpful for some children with ASD in two randomized, double-blind, placebo-controlled studies. The body can make a limited amount of carnitine, and it is present in high amounts in beef and moderate amounts in pork, but not much in other foods. So, if a person does not eat 2 servings/week of beef (or twice that of pork), then they should do a trial of a high-dose carnitine supplement ( 50 mg L-carnitine/kg bodyweight-day, max of 1 g/day). 2) Should I consider blood tests before taking supplements? For a general vitamin/mineral supplement, it is cheaper and easier to just try it for 2-3 months, and determine if you see benefit. 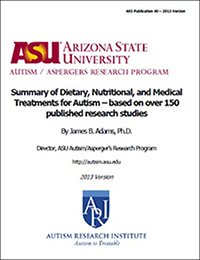 It is expensive to measure the levels of all vitamins and minerals (about $500 or more), and children with autism can have normal levels of some vitamins like B12 or folic acid but actually need more (see Adams et al 2011 Nutritional and Metabolic Status of Children with Autism). 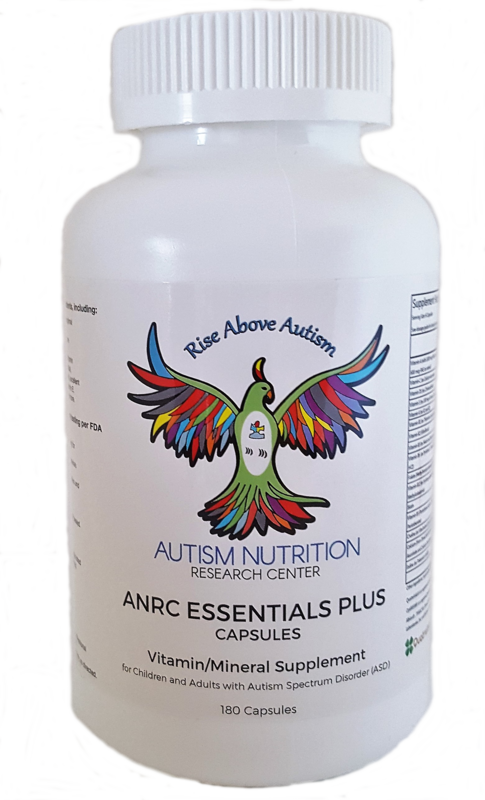 Vitamins and minerals at the level in ANRC Essentials (see ingredients) were chosen to be safe for the vast majority of children and adults with autism. However, testing iron levels is useful because too much or too little iron is a problem. Also, blood tests of iron are inexpensive and usually covered by insurance. Vitamin D testing is also useful because many people do not get enough exposure to the sun, so blood testing is useful to help you determine how much extra you may need. 3) Should I try injections of vitamin B12? Several research studies clearly indicate that children with ASD have an increased need for vitamin B12 and folinic acid (a special type of folic acid) due to problems with methylation and oxidative stress, and several studies by Jill James indicate that injections of methyl-B12 improve those levels. Similarly, another study (Adams et al 2011) found that an oral vitamin/mineral supplement with vitamin B12 and folinic acid had similar benefits in improving methylation and oxidative stress. So, both forms are beneficial. If you use the injections, we also recommend taking a broad spectrum vitamin/mineral supplement due to the many other important nutrients it contains. 4) Should I try a hair test to determine the need for essential minerals? Hair is a reasonable method for testing levels of toxic elements, but it is unclear if it is reliable for testing levels of essential minerals. Instead, we recommend blood tests. 5) How do I know what fish oil to try? There are many brands of fish oil. We recommend tasting them - a quality oil should have a mild taste, like a salad oil. If it smells bad, it is bad - trust your nose. Nordic Naturals and Tyler Eskimo are two companies that we like, but there are many others. 6) Should I take cod liver oil or fish oil?